Koi ponds come in many shapes and sizes, from the relatively modest sized pond that may hold a mixed collection of koi carp and Goldfish, through to ponds of many thousands of gallons, stocked only with top quality Japanese Koi. Many Koi keepers started their interest by introducing a few Koi carp into a small, pre-formed plastic pond to provide a colourful addition to their Goldfish. However, whilst you may have some success in ponds like this, there is no doubt that the koi will not achieve their full potential. There are several drawbacks to koi keeping in small ponds: the water temperature and chemical composition are prone to sudden changes, the size of the Koi is limited by the build up of waste in the water and the shape of the Koi is likely to be affected by limited swimming area and a lack of depth. 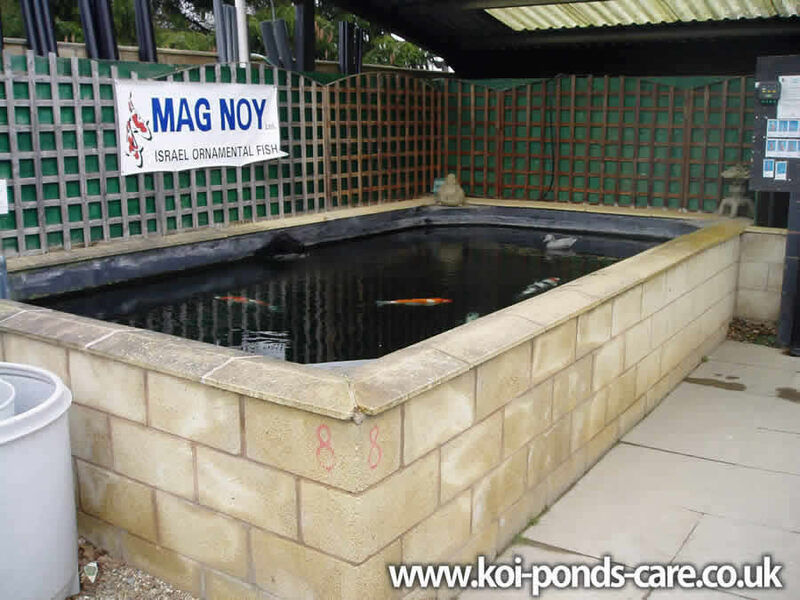 Having accepted that there are problems with very small shallow ponds we can now take a look at the requirements for purpose built Koi ponds. A Koi pond needs to provide clean, well oxygenated water in order to produce a healthy environment for fish to live and grow. The basic requirements are: To be large enough to accommodate the potential size that Koi can grow to ( 24 inches / 60cm plus). A pond of around 8 feet x 6 feet and 4 feet deep (2.5m x 2m x 1.2m) containing approx' 1200 gallons (5500L) would be a sensible minimum for keeping Koi in the UK or other temperate climates. The larger the pond the better it will be, an example of this is the pond picture to the left, many Koi keepers have found that what appears to be a massive pond, soon looks too small for their growing collection of fish. Many people find they end up building two, three or more Koi ponds before finally arriving at the perfect set up. While it is tempting to economise, it is well worth bearing in mind that building a good size pond in the first place is cheaper than building a succession of Koi ponds. The larger the volume of water the more stable the pond will be. A hot day can send the temperature soaring in a small pond, whilst a cold night can see it plummet. Fish are cold blooded and their body temperature matches the temperature of the pond. Sudden changes in temperature will cause physical stress and may lead to disease. This also applies to Goldfish and other pond fish. But Koi carp have been progressively interbred over many years to develop their colours and like most pedigree animals are relatively delicate. For this reason they may develop health problems in conditions where Goldfish are living quite happily. The stability of the water temperature is also greatly affected by the ratio of surface area to volume. The larger the area in relation to the depth the greater the affect of sudden changes in air temperature, if you have two ponds with the same volume but one is deeper than the other it will be less affected by temperature fluctuations. In addition to helping create a more stable environment, a good depth helps to exercise your Koi. Swimming up and down helps develop the muscles and maintain a good streamlined, cigar shape to their body. Koi that have been kept in shallow ponds typically develop a somewhat obese rugby ball shape. As well as considering the size of the pond, it is worth spending a little time considering the shape and construction method. Ponds with simple shapes and flowing curves allow a good circulation of water and avoid dead spots. Construction in concrete blocks, with a rendered surface and finished in fibre glass allow for the rounding off of corners in a rectangular pond and sloping of the pond base towards the bottom drains. This method of construction is the most expensive but gives the best results. 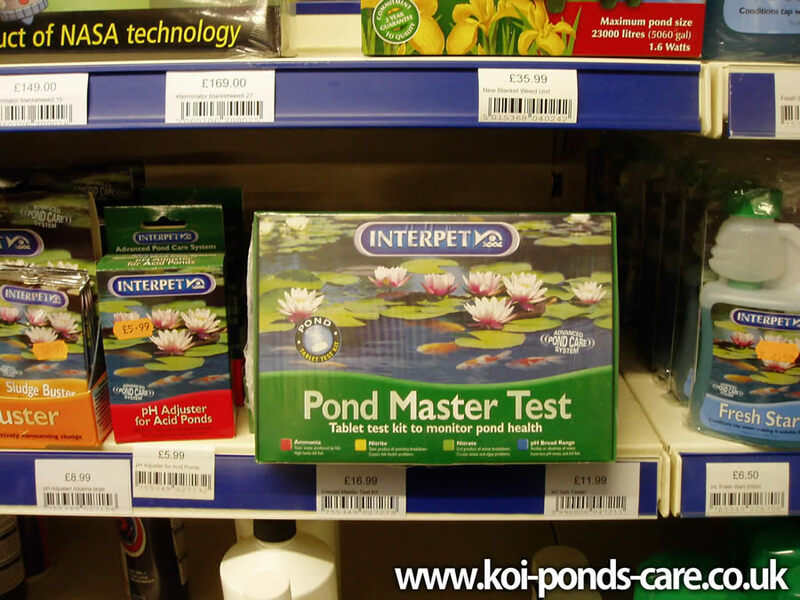 Care should be taken to make sure the type of final gel coat used with the fibre glass will completely cure and not leach styrene into the water with potentially fatal results for your Koi. There are a number of specialist fibre glass firms that will undertake this work and a firm that has experience of building Koi ponds will ensure the correct finish is used. 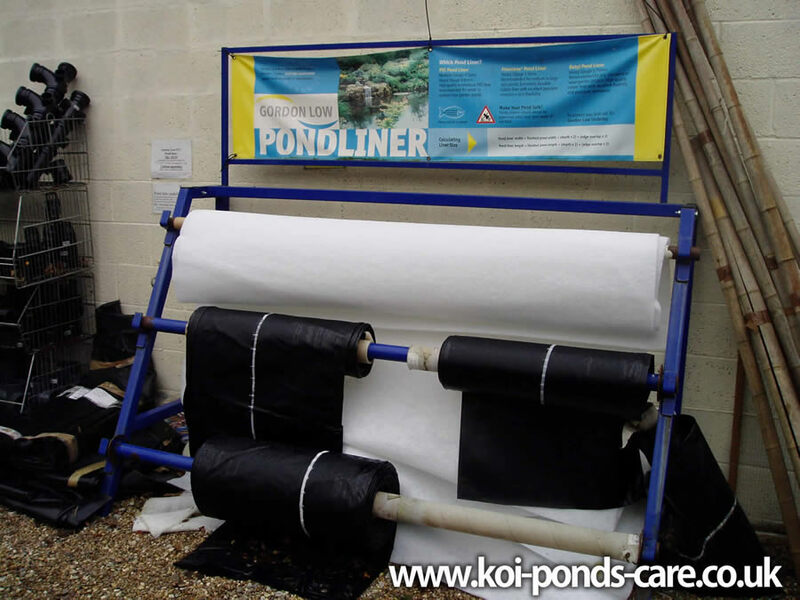 A cheaper alternative and probably the most commonly used method of building Koi and Gold fish ponds is to use a good quality rubber pond liner similar to the liner pictured above.To calculate the size of liner required, measure the longest distance across the pond and add twice the maximum depth to obtain the length. Measure across the widest point and add twice the maximum depth to obtain the width. Then add a foot (30cm) to each measurement to allow for an overlap. So for a pond of 8 feet x 6 feet x 4 feet deep the liner would need to be 8 + (2 x 4) + 1 = 17 feet long and 6 + (2 x 4) + 1 = 15 feet wide. When fitting the liner, care should be taken to pleat and fold the corners carefully to minimise the chances of debris becoming trapped. The corners can be fixed down flat with special mastic tape to give a good finish. 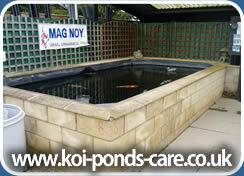 After settling on the size of your Koi pond, the next step is to ensure good filtration. 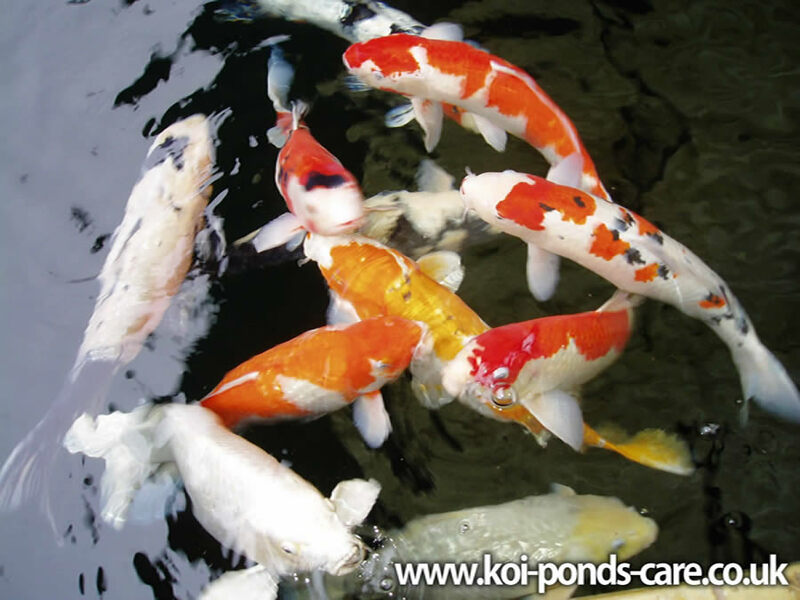 Koi produce large amounts of solid waste, so your ponds' filter system must have good mechanical filtration to remove solids from the water. The mechanical filter can be in the form of nylon brushes, plastic media or a vortex that slowly spins the water and allows larger, heavier particles to settle out. The mechanical filter must be easy to clean and if it is fed from a bottom drain must have a valve to shut it off from the pond for regular cleaning. It is recommended to clean this section on at least a weekly basis. A good gravity fed filter system will incorporate a drain for easy flushing to waste and this can be used to carry out regular water changes. Biological filtration is the next step, a biological filter utilises bacteria to break down the ammonia produced as a by-product of the fishes' metabolism. The bacteria live on the surfaces of the filter media and break down the Ammonia excreted by your fish. To be blunt your lovely Koi pond is just a giant toilet bowl for your Koi .Unless the Biological filter breaks down the waste produced, your Koi will succumb to illness or be poisoned by the waste. Ammonia is broken down firstly to Nitrite and then to Nitrate, which is relatively harmless to Koi and other pond fish. The level of Nitrate is kept under control by regular small water changes. Please remember that it takes a minimum of five to six weeks for the bacteria in the filter to build up. During this period, only a few fish should be introduced and the amount of food kept to a minimum. It will probably take several months for the filter to fully mature. Water can be fed into the filter system either by a pump or by a drain in the bottom of the pond. 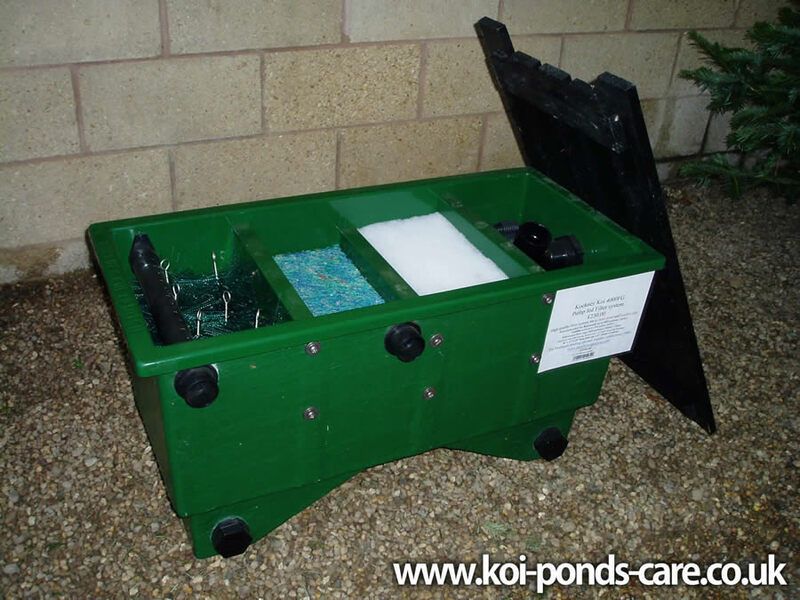 Most modern Koi ponds use a bottom drain and this has the considerable advantage of delivering solid waste to the filter system in an intact state, where it can be more easily settled and removed from the pond. 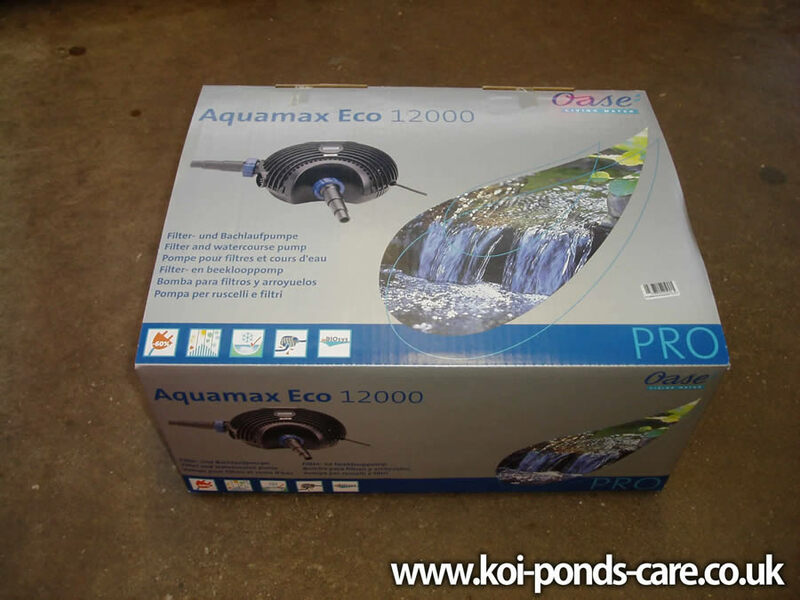 This is called a gravity fed filter system and unless there is some particular reason why one cannot be installed, we recommend this as the best method of filtering Koi ponds. 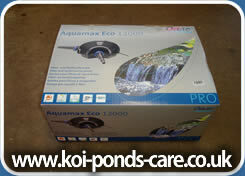 There are many makes of commercial biological filters on the market that will keep good healthy water for your Koi. 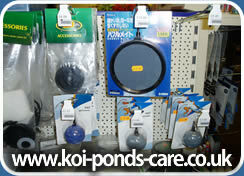 As with the size of the pond itself, bigger is usually better and cheaper than buying another filter at a later stage. Remember to buy a filter that will cope with the expected size of your fish in a few years. 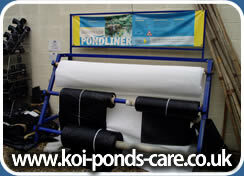 A Koi pond biological filter is the vital life support system that will keep your fish alive. It is far better to spend your money on a good filter system even at the expense of not being able to buy many Koi to start with. Important! even with the best filter systems, frequent water changes are essential to keep your fish in good health and obtain maximum growth. 10% a week is a good minimum to aim at, in an averagely stocked pond. Your biological filter will break down Ammonia but there are many other by products of the fishes' metabolism that will gradually build up unless water changes are carried out. The filter system needs to be powered by a good quality pump capable of circulating the total volume of pond water through the filter in around one to two hours. This rate of turnover should allow the ammonia produced to be broken down at the same rate it is produced. When choosing a pond pump remember to look at the amount of electricity consumed, this is an important factor when the pump will be running twenty four hours a day. Sometimes purchase of a cheap pump can prove to be false economy if the running costs are much higher than a more expensive model. 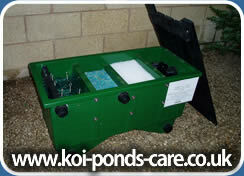 In this respect the Sequence pond pumps have proven to be a favourite of Koi keepers for many years. 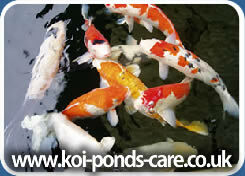 A final essential requirement in all good Koi ponds is a plentiful supply of oxygen. Both your fish and the biological filter require large amounts of oxygen to thrive. A good quality air pump such as those made by Secoh or Evolution Aqua can power several air stones even at five or six feet depth. 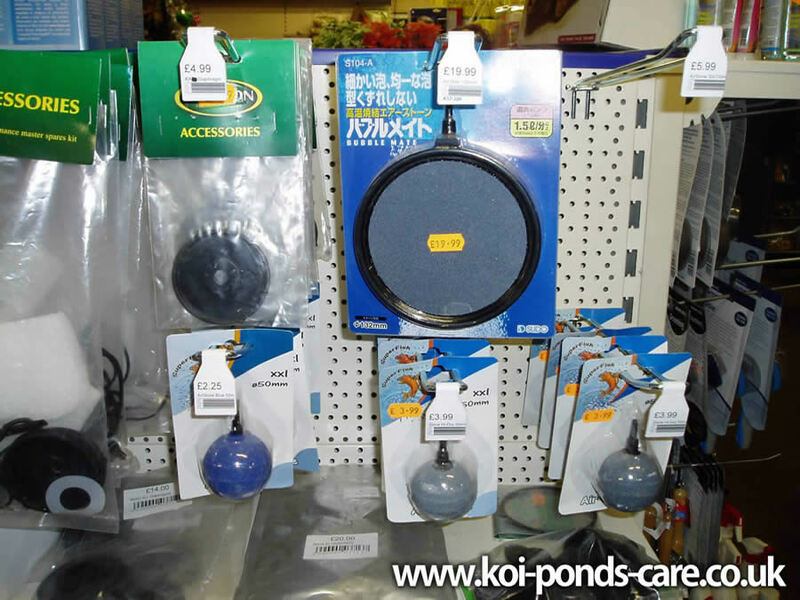 It is a good idea to place a few air stones (Pictured below) directly in the filter system to provide oxygen for the filter bacteria as well as in the pond itself. Oxygen will also be added by water splashing into the pond on its' return from the filter and waterfalls are especially effective in this respect. However, bear in mind if building a large waterfall the possible nuisance from the noise at night and also put in a system to bypass it in the winter. A large waterfall will have a big cooling effect on the water. There is less need to worry about the oxygen level in the winter as cold water holds far more oxygen than warm water and your fish will be less active and require less oxygen. 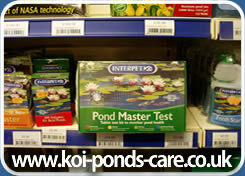 Last but certainly not least, every koi keeper should have test kits for Ammonia, Nitrite, Nitrate and Ph. (Pictured Right) You cannot see if the water is polluted and it is perfectly possible to have crystal clear water with high levels of dissolve Ammonia or Nitrite. Regular testing will ensure potential problems can be detected before they affect your fish. First steps to take if a problem is detected are to carry out a water change to dilute the waste (usually no more than 50% maximum to avoid shock to the fish) and stop feeding to avoid adding more waste. You can then investigate possible causes of the problem. Common problems include: overfeeding, too many fish and stocking the pond too quickly whilst the filter is still maturing.